Her relaxed but clearly excited demeanor didn't at all hint at the fact that the day before the the wedding she made a drastic change not many would be brave enough to undergo 24 hours before they were due to walk up the aisle. Yes. She dyed her hair. And while colour experts say that there's no reason not to change your hair prior to your wedding (especially if you're considering going back to your own natural colour, as Eugenie did) a concern would be that being so close to the event you could be at risk of leaving yourself with little time for corrections. While a gloss or a toner is a common process for a bride before the big day, a full colour change is a little more unusual. However it clearly worked like a charm for Eugenie who looked stunning with her auburn tone, surrounded by the autumnal hues of her stunning wedding flowers and decor. The bride opted for a classic chignon for the day, wearing her wispy hair soft yet sophisticated with her Greville Kokoshnik emerald studded tiara - lent to her by her grandmother for the day. The parting in the centre of the hair, John Harvey from Peter Mark tells THEVOW.ie, worked particularly well with this accessory - which balanced itself with an equal balance of emeralds, three on each side. "Normally with hair up we would recommend a side parting as a centre part can sometimes look a too modern and depending on your face shape even a little harsh," says John, "but when you have the Queen’s jewellery box to raid for your big day it’s important to compliment the accessory with your styling. And what an accessory!" The chignon, he adds, is a popular choice for both brides and bridesmaids for the wedding as it can strike a nice balance between having your hair up and wearing it loose and down. 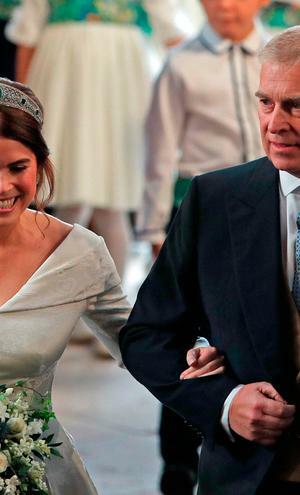 For Princess Eugenie, her hair style, her lack of a veil and her low back allowed her to display her surgical scars from the operations she had as a child to help with the scoliosis - a curvature of the spine - which she suffered from since birth. The classic chignon style was also worn by Kate and Meghan on the day, which offered a chic and feminine style that stayed in place despite the whipped up winds from the tale of Storm Callum. "That's the great thing about a chignon," says John, "the structure and security it gives you as there is no need to worry about factors like the natural texture of your hair causing it to come loose or if you are having an autumn/winter wedding the structured and controlled can help combat any wind or rain." 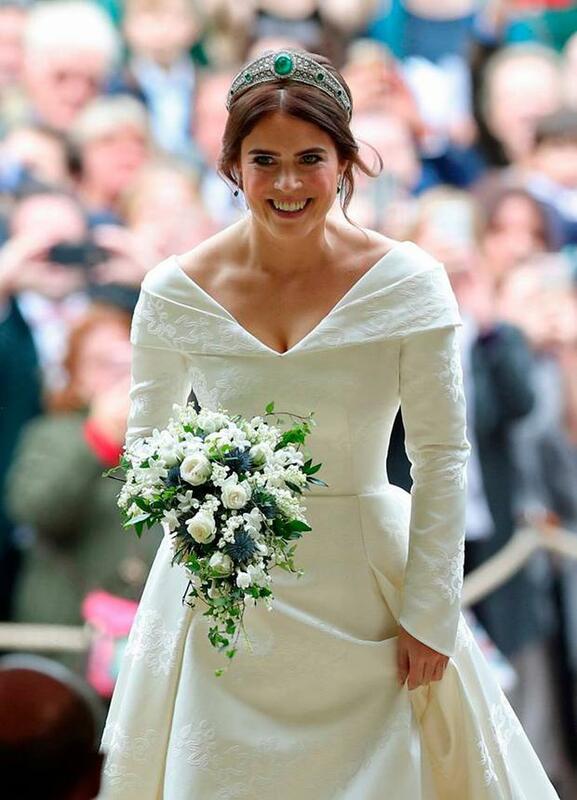 The bride's subtle, natural make up was done by Hannah Martin for Bobbi Brown. Peter Mark's John Harvey offers his guide to achieving the princess' classic chignon at home. "The trick to a successful chignon is in your ponytail - it is crucial that you take your time getting it super secure and neat as this will anchor your entire look. A little trick you can use is to apply a light mist of Redken pillow Proof Primer €19.90 to make brushing your hair back into a pony easier. This product will dry into your hair and become invisible leaving you with a super sleek effect (apply before blow-drying for a quicker drying time and heat protection). From here on out anything goes once you’ve lightly sprayed your pony with Elnette €6.99. You can back comb and pin it up. You can plait and pin it up. You can simply keep twisting the pony until it wraps around itself and then pin it. When it comes accessorising size and placement or key. If you have small and delicate features you can’t afford to overpower your face with a huge hair piece. Chose something that is also smaller and delicate to compliment. If you have large features or strong bone structure and face shape then placement is key for you. Try to avoid placing anything to close to your hairline as this will make your look seem heavy. You must also keep away from putting anything high up on your head to avoid making your face and features appear larger/stronger. If your keep a couple of inches in from your hair line and place your piece on the curve or round of your head you can’t really go wrong. A nice little touch after your done to give your look a more modern feel (depending on your outfit) is too lightly brush your sleek front sections towards your face with a bristle brush. This will give you that runway editorial wisps that will really set your look apart or if your attending a royal wedding you can pull out some strands around your face to soften the look without losing the security of the style."